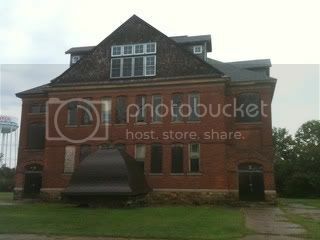 The First Ward School was built in 1896 in Wisconsin Rapids, WI. It is still today the oldest school building in Wood County. This school house is surrouded by local legends of haunting and paranormal activity. Most stories focusing on a little boy named Oscar that died there. After investigating this location we fell in love with the place and bought it. We are making this place our family home and have installed a camera system where you can watch live streamed video 24/7 on this site. You can get your ghost fix anytime of day and investigate the cameras. Or you can just tune in and see what the family is up to that day. Reports of activity? Two seprate times upon entering the building we heard a man voice saying "Hello" to us, no other people were in the building at that time. Sounds can be heard of school desks being moved but no desks remain in the building. We've heard footsteps following behind us and a man whistling. We also saw a shadow person in the basement and have recorded multiple EVPS. Every floor of this building seems to have activity. Neighbors also keep sharing their stories with us too. They report seeing mysterious lights in the building as well as sometimes seeing an elderly gentlemen through the windows on the third floor. There are also reports of seeing a little girl crying on the property. Watch for this location in a future episode of "Relatively Haunted". You Can Also Find The First Ward School On . Here's A Quick Tour Video Of The School. If You Liked This Clip Please Subcribe To Our Channel, Or You Can Also "Like" Our Show's Page. Thank you For Your Support!